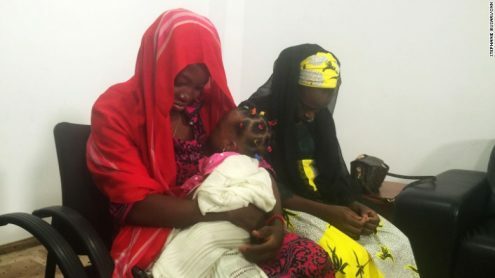 The first of more than 200 abducted Chibok schoolgirls to be rescued from Boko Haram after two years in captivity in northeast Nigeria said on Tuesday in her first interview that she just wants to go home.Amina Ali and her four-month-old baby were rescued in May near Damboa in Borno state by soldiers and a civilian vigilante group. After her rescue sparked a blaze of global media attention, the 21-year-old and her child have since been hidden away in a house in the capital Abuja for what the Nigerian government has called a "restoration process". She told the Thomson Reuters Foundation in an exclusive interview. "I just want to go home - I don't know about school,"
"I will decide about school when I get back, but I have no idea when I will be going home," Ali said, speaking softly while staring at the ground. I think about them a lot - I would tell them to be hopeful and prayerful,"In the same way God rescued me, he will also rescue them." Ali, who was found by the army in May along with a suspected Boko Haram militant, Mohammed Hayatu, claiming to be her husband, said she was unhappy to have been separated from the father of her four-month-old baby girl. "I want him to know that I am still thinking about him," Ali said, relaxing and lifting her gaze off the ground only to breastfeed her child when she was brought into the room to feed.Just because we got separated, that does not mean that I don't think about him,"